that would go with their colors and decor in the rest of the house. They were very happy with this finish! 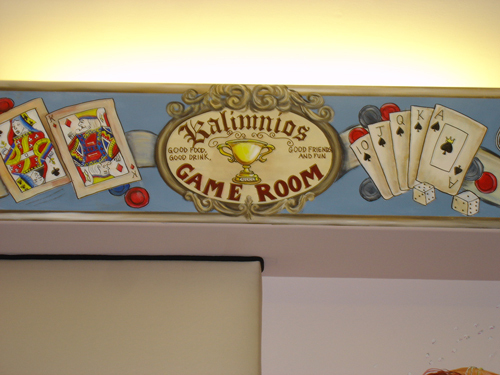 We had so much fun with this mural! 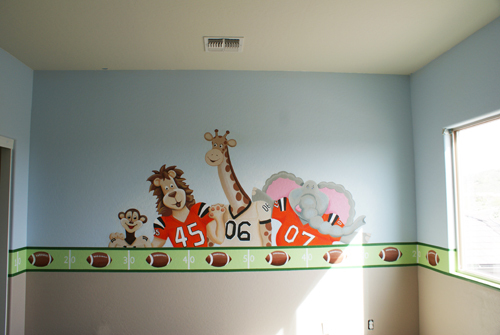 We painted a mural a couple of years ago with jungle animals playing sports. 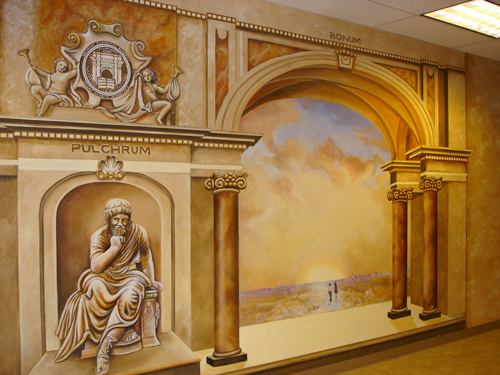 We were delighted to paint this mural for Archway Classical Academy in Chandler, AZ. 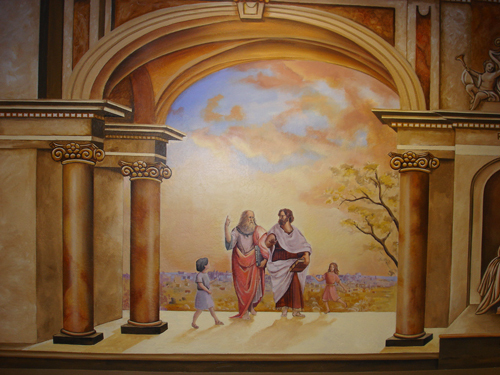 They wanted a mural that had archways in it, (to go with their name), Socrates, Plato and Aristotle. everyone loved it! We completed it the day of the open house, and it was a huge hit! desert landscaping, rocks, flowers, plants, trees, cowskull, lizard, and roadrunner! 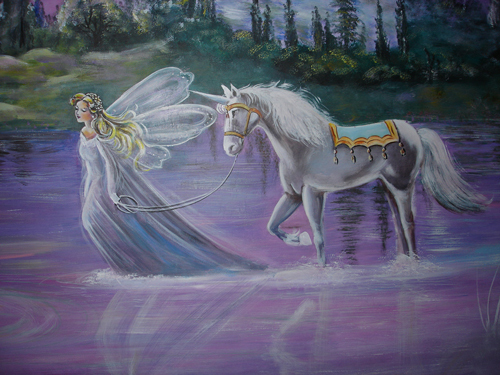 depiction of someone's dream and vision! 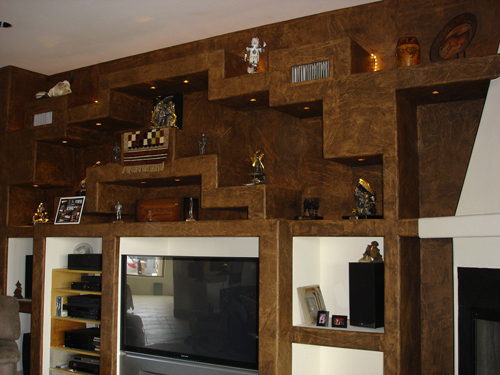 look like real wood with knots and graining. Now for the fun part - Coloring! This is where the real artist in me comes out! I love the coloring part of the process! We highlighted all the stones on the raised areas. We colored all the stones with about 10 different colors! Then we antiqued all the stones in the cracks. our own stones and character.Then we softened the edges and cleaned up all the access grit. This is sure messy, but fun and artistic! 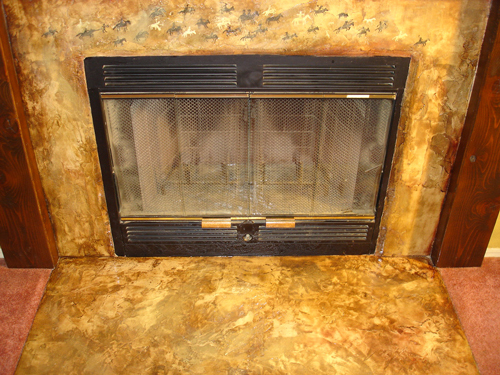 Fireplace Wall Before - Plain Painted. Today I finished the back wall, which is the wall you see when you first walk in. I added detail, the purple '12' ball, Rosemary picked this one for the big ball in the mural, as it's her birthday. I completed the center sign with a trophy. Today we added Anthony and Stevens' favorite dogs to their murals. we just need a few minor details. And here we have Speed-Demon-Anthony! With branch and bird nest in his hair,dog plastered in front, he's dragging a stoplight he ran over, crashed through barricades, and stop sign, not to mention speed limit sign! He has cop chasing him, what's he thinking? He's on the cell phone with his wife, and must want to get home in a hurry! Rosemary at Piano with roses and sheet music and musical notes flowing from her! Rosemary plays the most beautiful music! She is very talented! Just enjoying life at sea - and his hot dog! 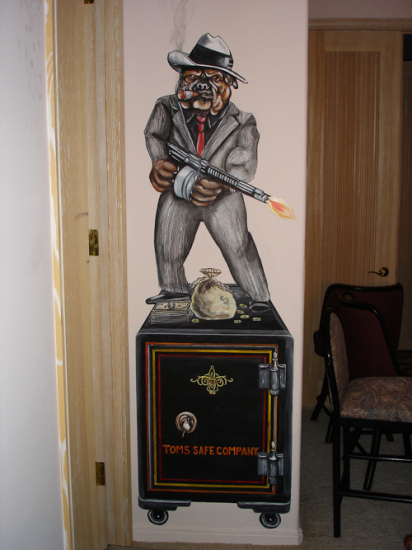 Bulldog Gangster with machine gun guarding the safe! 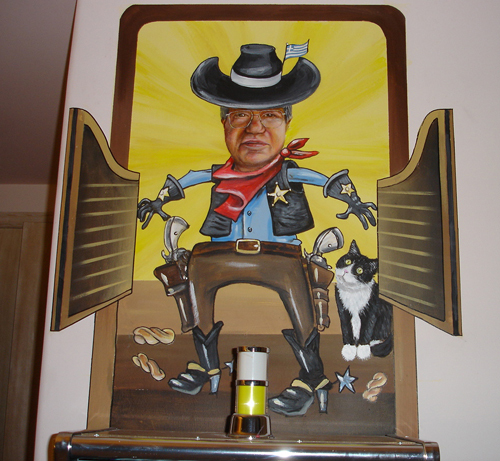 First we have Cartoon Cowboy Tom busting into saloon ! Old World Breakfast Nook Completed! 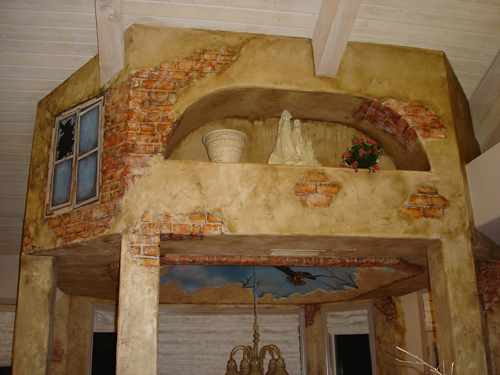 Like old, ruins in Italy or Greece, exposing brick and worn plaster, utterly run-down masterpiece! 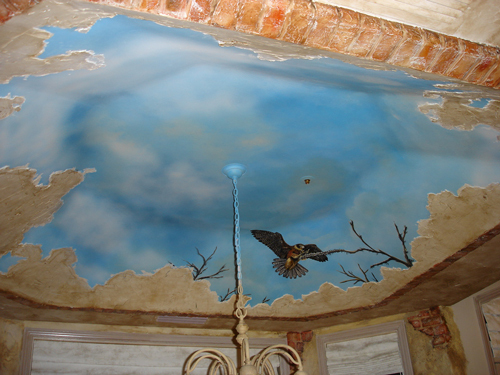 In ceiling of breakfast nook, we painted a sky with a hawk landing on a branch. 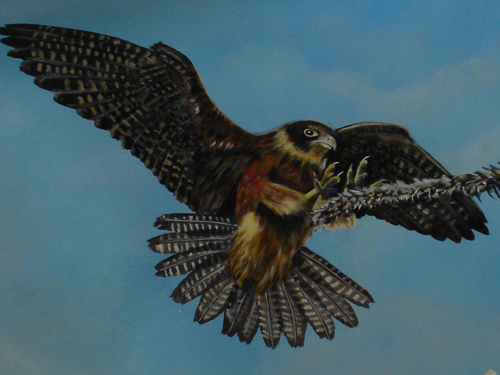 we're painting a Hawk landing on a branch. 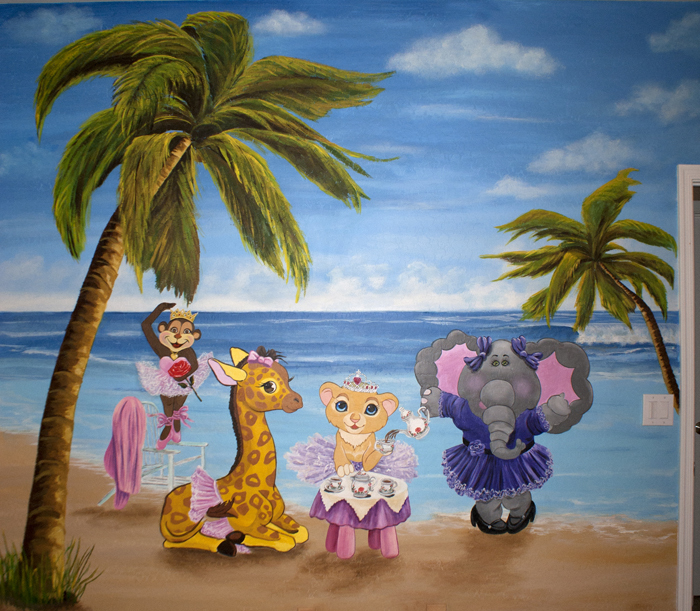 I finished the mural, softened the edges, added reflection, fairies and unicorn. 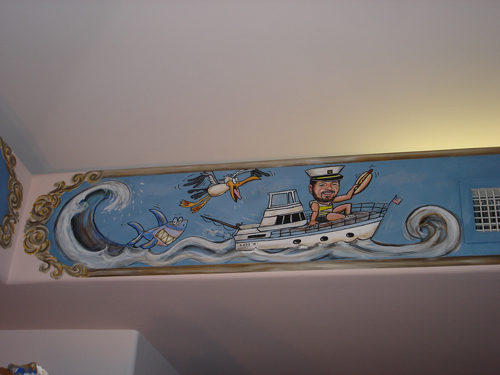 This was a really fun project and the clients were very pleased with the mural. Tomorrow I'll finish the unicorn, fairies and soften the edges. I started painting from the top, the sky. Then I painted the castles and the trees. Next, the lake and reflections. 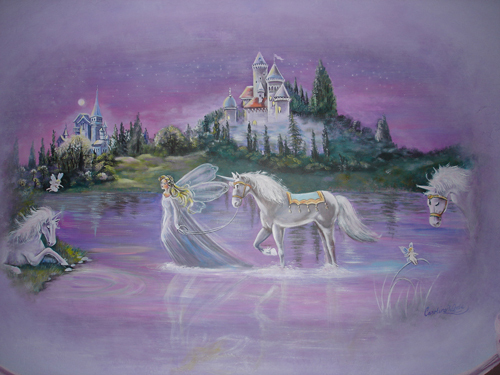 Here I sketched the mural of the fairy, unicorn, castles. We have a blank wall the we will transform into a baby girls' room that will be born in May. 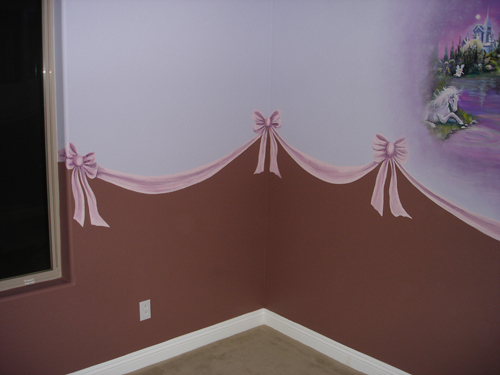 First, the ribbon line was chalked in and the bows drawn in. The lower half is painted a plum mocha color, upper half is painted a periwinkle lavender color. 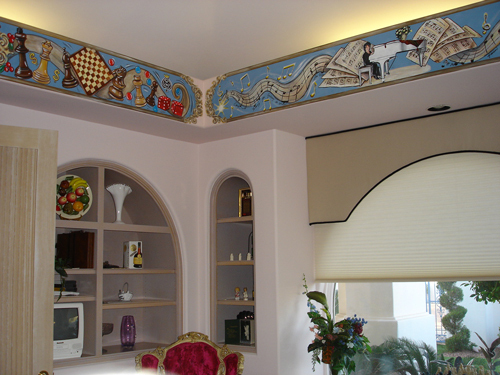 The ribbon is free-handed and shaded with five different colors. 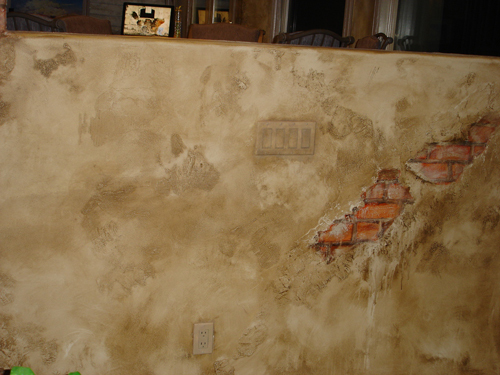 The area in the middle is smoothed out with wall joint compound to prepare for a fairy mural still to come! The smoothed out area was primered and painted, ready for the mural. 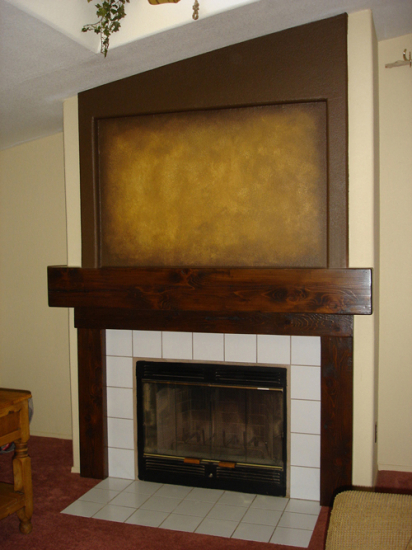 Fireplace walls are focal points in a room and with the right touch, can transform an entire room! We did just that with this one. 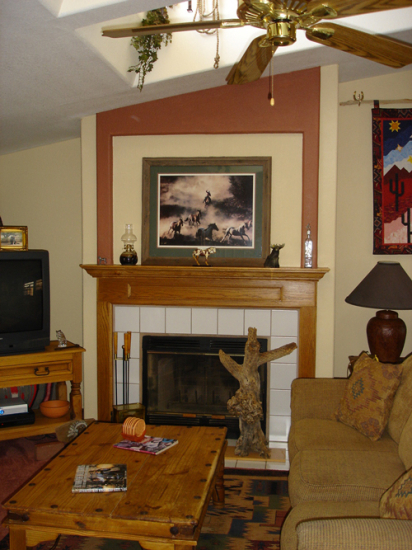 Above is the fireplace before. 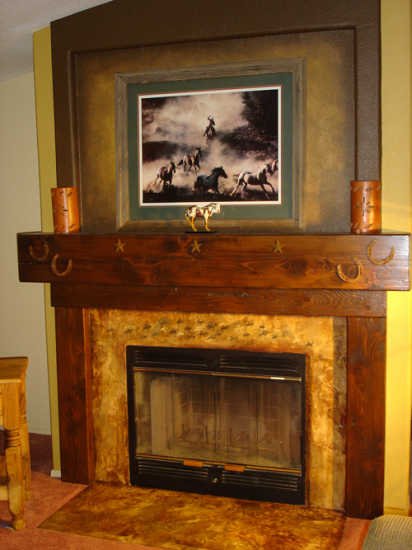 We built a new mantle out of very charactered, rustic wood, and stained it. 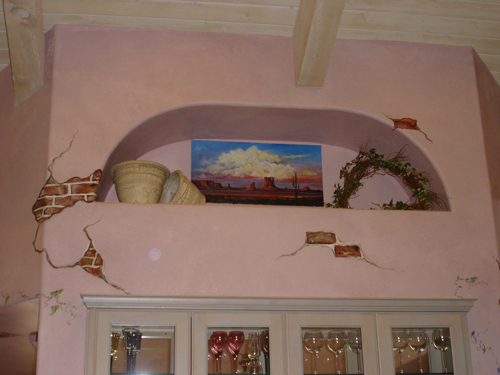 Then, faux finished the niche and painted the surrounding wall. 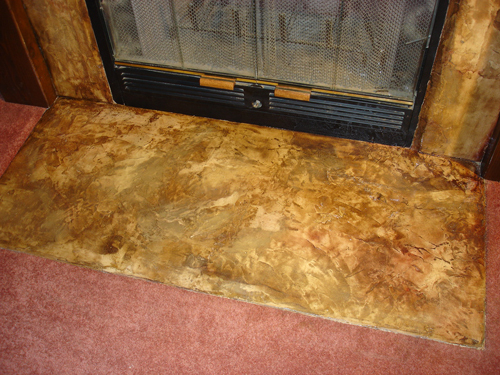 We covered the white tile with a stone product that we trowelled on and stained with several colors. I painted some heiroglyphics on the stone above of horses and riders. Here is the finished product. It turned out fabulous! 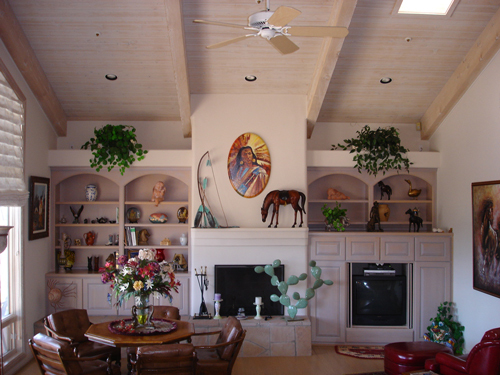 The clients, Cheryl and Todd are very pleased, and want more work done now. 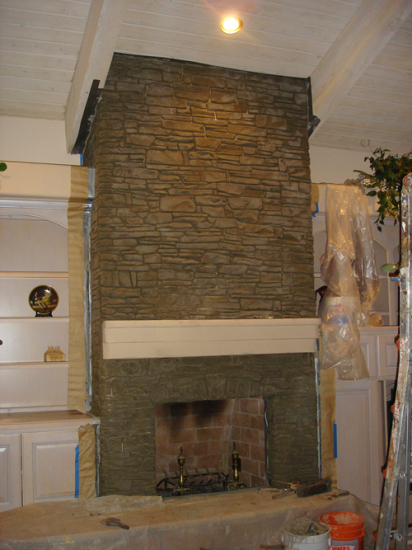 They enjoy sitting in front of their brand new fireplace every day! 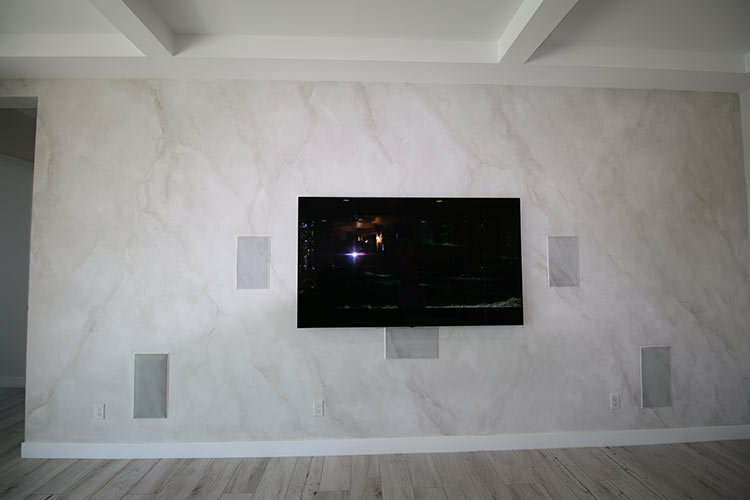 We transformed this entertainment center from white to antique leather. 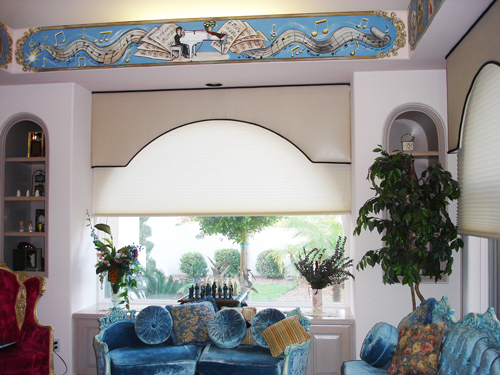 The clients love it, and tell us that all their friends love it too. This is one of our more popular finishes. 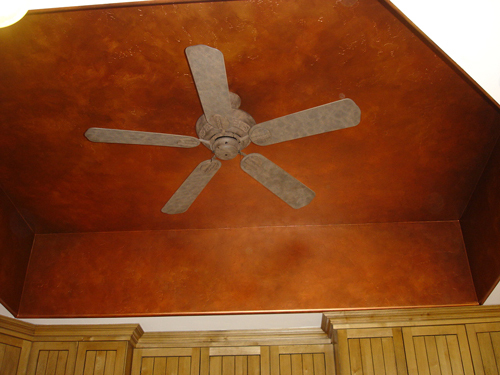 We also faux finished their kitchen ceiling and painted a copper metallic finish with antiquing. 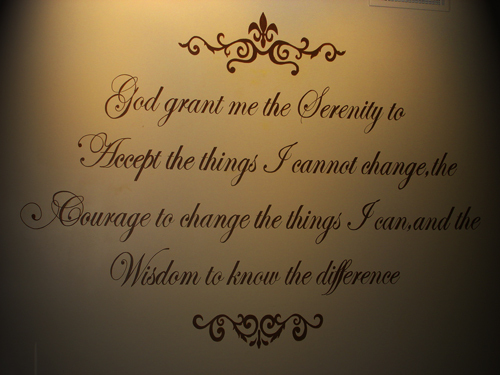 Well, we had a request from a client for a hand-painted Serenity Prayer Mural for her husband on the bedroom wall for Christmas. What an exciting project! This well-known, beautiful saying apparently has very special meaning to him, and they recite it together EVERY night! Wow! We can all learn from that! After deciding where to paint it, we decided on brown to match the bedroom. It took us 10 hours but we completed it, and it came out fabulous! Her husband was instructed to stay out of the bedroom, however their German Shepherd kept pushing the door open out of curiosity, and we had to go and shut the door constantly, it was so funny! We had a great time painting and listened to Christmas music. 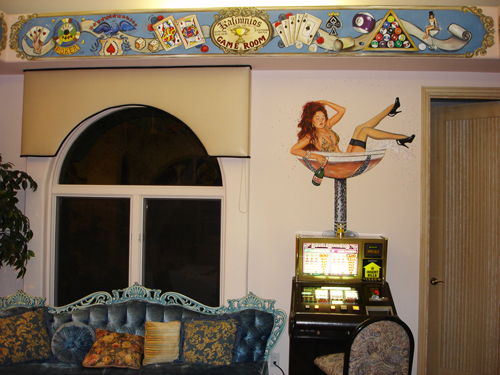 After we completed the mural and cleaned up, the client brought her husband in with his eyes closed. 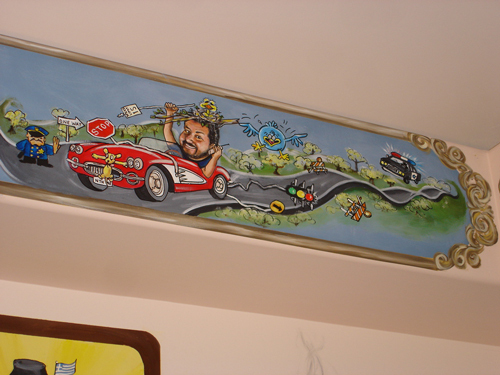 When he opened his eyes in front of the mural, his mouth just dropped and he was so excited! Then he played with the dimmer switch for the two spotlights as you can see in the photos below. I hope we get alot more projects like this one, especially seeing their faces light up! The feeling is indescribable!